I'm a huge fan of a zoysia grass that grows all over Big Corn Island but didn't grow at False Bluff until I managed to find enough in Bluefields to start it here. A review of earlier posts will give an indication of just how highly I rate the stuff. One of the reasons I like it is that it doesn't need to be cut. Here, cutting grass involves a machete...time consuming and not good for a body. Also it spreads fast, it chokes out weeds, it forms an incredibly tight mat (almost like steel wool) that even snakes can't invade - and of course it helps control erosion. But a reason that's real obvious can be seen in the photo below. During the dry season, lack of rain coupled with the hot tropical sun cause a lot of damage to plants and most ground covers wither and turn brown, if not die outright. Not this zoysia. Bright green, emerald green, is its signature regardless of the season. 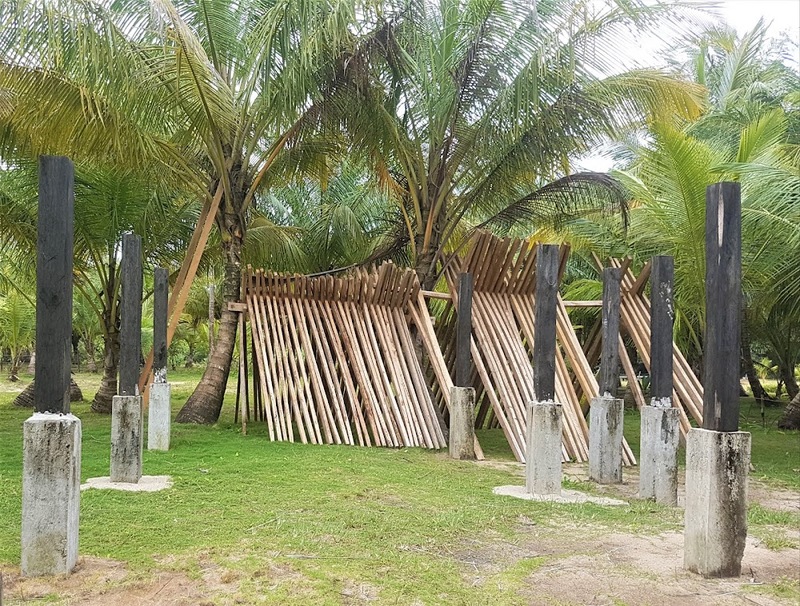 We're planting it at the base of each and every coconut tree, whether the tree was here already or is one we planted...hundreds and hundreds of coconut trees. The grass here has proven to have an affinity for coconut trees and it grows in tentacle-y patterns that radiate from and around the base of each tree. Eventually the spaces between tentacles fill in, forming a spreading circle as is the case of the circle around the tree in the first photo here - the photo which shows just how little effect the dry season has had on it and on the other spreading circles visible in the background. And, of course, over time, the circles around the individual trees join up. We planted all but the three skinny-trunked coconut trees that are visible in the above photo. And then we planted this grass at the base of almost each of them.